The UK’s energy security will increasingly depend on large scale offshore wind power, write Ian Broadbent and Peter Strachan. But while energy secretary Amber Rudd talked the sector up in a recent speech, she revealed feeble ambition. Worse, with its premature cutbacks on onshore wind, and its obsession with nuclear power, the government is undermining confidence among investors. Onshore wind is potentially Britain’s lowest cost electricity source, but it’s firmly out of favour with the UK government – something made clear last Monday when energy secretary Amber Rudd, told Parliament of the premature pruning back of onshore wind subsidies. But what about offshore wind? Listen to her speech to RenewableUK’s Global Offshore Wind Conference, and it sounded like she was all for it. “In the last 5 years alone, the amount of electricity being produced from offshore wind has more than quadrupled”, she enthused. “In the same period we have seen around £10bn of private sector investment. And the industry now supports around 14,000 jobs. “So you represent one of the 21st century industrial success stories. You – we – are world leaders. Pioneers. Innovators. The best business minds working with the best engineers, within one of the world’s strongest policy and financial frameworks. At this point you might forgive listeners if a warm glow came over them as they looked forward to expanding prospects for the UK’s offshore wind sector backed by firmly supportive government policies. And after all, why not? The UK has some of the world’s richest offshore wind resources, and is ideally situated for offshore wind deployment. Harnessing the potential of offshore wind could act as a catalyst for economic growth, inward investment and employment, as well as help the UK to meet its binding European 2020 targets on renewable energy. Indeed, Rudd claimed that the success of the UK offshore wind industry will be a “feather that she can wear proudly in her cap” at the UN Climate Change Conference in Paris later this year. And as she told the conference, Britain is indeed a leader in the sector, with over 5GW of offshore wind capacity already deployed, and a further 4GW consented and ready to build. Moreover offshore wind has one key advantage over onshore – at sea, the wind blows almost all the time, as any sailor knows. So that means that offshore wind generates electricity far more dependably than onshore, with fewer slack periods, if at a higher cost. So here’s how Rudd dropped the bad news – while making it sound utterly wonderful: “We expect to see around 10GW by 2020, much more than any country in the world. And we are achieving real progress towards that. Just last week we saw the opening of Gwynt-y-Mor, the second largest operating offshore wind farm in the world. A £2bn project built by RWE, with the capacity to produce enough electricity to power the equivalent of around 400,000 homes. Vattenfall’s Kentish Flats Extension will deliver an extra 15 turbines, capable of generating enough electricity to power the equivalent of 35,000 homes. And DONG’s Westermost Rough also opens next week, the first windfarm anywhere to use the next generation 6MW turbine on a large scale. Now look at those figures. We have 5GW already, we have 4GW already consented with much of it under construction, and the ambition is to deliver 10GW by 2020 – that’s just 1GW more than is already committed. In other words, the UK’s offshore wind sector faces a dramatic curtailment once the current round of construction is over and done with. It’s true: offshore wind is expensive! One reason for that could be that offshore wind is very expensive, a fact that is not lost on critics of the industry. The costs of producing electricity from offshore wind have not fallen fast enough to make it a viable commercial proposition, without the help of public financial support in the form of subsidies, currently given in the form of Contracts for Difference (CFDs). And the prices in the last CFD auction in February were high, in the range of £114 to £120/MWh guaranteed for a period of 15 years. Successful awards went to Scotland’s 448MW Neart na Gaoithe project and the 714 MW East Anglia ONE offshore wind projects. However, other Scottish and UK projects were left out in the cold. The industry aims to bring the price down to £100/MWh by 2020. But in Denmark, where over 1.2GW of new kit has been successfully deployed, prices are already far lower than here. The 400MW Horns Rev 3 project is set to deliver power at an industry-leading €103.10 (£73.40)/MWh. So what’s the difference? Well first, the Danes have a firmer control over contract prices and costs. Value for money is paramount. Second, the government has put in place secure, long-term poliices that give investors confidence. That keeps the cost of capital low – very important as, with the wind itself coming free, it’s the major part of the cost of the power it produces. In the UK, by contrast, there are numerous hazards for investors to contend with. The Treasury is constantly seeking to cut costs and axe projects across the whole spectrum of public spending. The Electricity Market Reform changes to UK offshore wind subsidies by the late Coalition Government have led to uncertainty in the industry. And offshore wind is subject to additional uncertainly by having to compete in CFD auctions with other ‘less established technologies’ such as wave, tidal, and geothermal. But the greatest fear among prospective investors is that the offshore wind industry will ultimately suffer a similar fate to that of onshore wind, where many projects have been effectively frozen in the pipeline. This has undermined confidence – and pushed up the cost of capital. The EU Commissioner for Climate Action and Energy, Miguel Arias Canete, has warned that the UK’s decision to curtail this subsidy mechanism for onshore wind will make it harder for the UK to meet its legally binding climate change targets. The other problem is the UK’s obsession with nuclear power. Funding for new energy projects via the Levy Control Framework has disproportionally favoured nuclear power at the expense of offshore wind. And the government is prepared to make truly enormous, long-term commitments to nuclear. The troubled Hinkley C nuclear power station has been promised a staggering £92.50 per MWh, inflation-proofed, for the power it produces, not for 15 years like offshore wind, but for 35 years from commissioning in 2023 or beyond (if it is built at all) on top of £10 billion in construction guarantees. That £92.50 is less than the wind industry’s target of £100 for offshore wind in 2020, but the subsidy goes on for more than twice as long. And it’s much more than the current Danish price of offshore wind of £73.40 per MWh – a price that reflects investor confidence and lower cost of capital. Mike Parr, the Director of PWR Energy Consultancy, provides unequivocal evidence on this crucial point. Moreover the cost of wind power, in Denmark and elsewhere, is only going to carry on falling with experience and improvements in technology. Significantly, the Danish model allows local people the option to take a 20% stake in projects and at cost price, so there is significant public participation in wind. So with political will and institutional capacity, highly competitive project financing, combined with very high levels of public support, offshore wind is not a hard sell in Denmark. The case for Danish offshore wind is further strengthened when the length of contract and the effects of inflation are brought into the equation. With significantly shorter contracts the ‘levelised cost of energy’ (LCOE) is just €68 (£48.40) / MWh for Danish offshore wind, little more than half the cost of nuclear power from Hinkley C.
In short, there’s no competition: Danish offshore wind wins hands down! And that’s against both British nuclear power, and British offshore wind. Despite Ms. Rudd’s assertion that the outcome of the next round of Contract for Difference auctions will be known “in the next few weeks”, this is a nervous time for several offshore wind projects. The industry is already starting to feel the pinch from this lack of confidence. 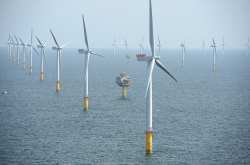 The European Wind Energy Association (EWEA) has highlighted a hiatus in UK offshore wind projects coming forward. And without a strong pipeline of projects it will not be possible to secure the economies of scale necessary to drive down costs, and accelerate deployment. Moving the goalposts for onshore wind has surely signaled to offshore wind investors that the UK government cannot be trusted to deliver on its own stated timetables and financial commitments where renewable energy is concerned. In her speech, Rudd signaled that the CfD prices for offshore wind must come down over the next few years: “The Cost Reduction Monitoring Framework shows that costs have already fallen by over 10% since 2011, and more quickly than expected. But the trajectory of those price decreases is still a major unknown, as is the budget for the Levy Control Framework post 2020. We urgently need clarity and confidence in the future of offshore wind subsidy mechanisms if the sector is to thrive. With the imminent closure of the Longannet coal plant in Scotland and other coal-fired power stations in England, gigawatts of generating capacity are going to be lost from the UK electricity market, and very soon. Combined with the fact that we won’t see any new nuclear build this decade and perhaps not even until 2030, there’s precious little joined-up thinking on how to address potential shortfalls. More than ever, we must make UK offshore wind work – not only to meet our targets on carbon emissions and renewable energy, but for the energy security of the nation. Dr Ian Broadbent is a Senior Lecturer in Business Strategy, Department of Management, Aberdeen Business School at Robert Gordon University. Professor Peter Strachan is Strategy and Policy Group Lead and Professor of Energy Policy, Department of Management, Aberdeen Business School at Robert Gordon University. This article was first published by The Ecologist and is republished here with permission. All good stuff, but, in a week when the UK’s Competition and Markets Authority (CMA) issued the provisional findings of its year-long investigation and its proposed remedies to address the adverse effects on competition (AECs), I was expecting some observations on the impact of the CMA’s efforts on the omnishambles that is British energy and climate change policy and regulation. Mr Hunt – it is a private group. However, your point is a valid one (coverage of the CMA white-wash). I’d be asking a couple of questions to the (non)Competition and (non)Markets (non(Authority. 2. Why are Uk wholesales prices the most expensive in Europe (source: recent Tennet report) – (e.g roughly 2x Nordpool prices) – but hang on Nordpool has loads of RES….making it cheaper???? (DECC – oh not to worry – pass another cognitive dissonance pill – there’s a dear). I should add another comment. The CMA & its antecedents can be characterised by revolving doors – lawyers from outside go in, stay a short while and go out. This causes problems for DG Compo who like to have good relationships with national competition authorities. Problem is, people don’t stay long enough to build up relationships based on trust with Compo (Compo’s observation). Lawyers that exit (the CMA) often end up with law companies representing clients who have an “interest” in CA activity. I was engaged by one bunch against the CMA – revolving door had spat a lawyer out (to Tesco’s lawyers) who had just written a report that wanted to see the abolition of how magazines and newspapers were delivered in the UK (Tesco wanted the abolition so it could use its own distribution chain – as it happened I worked for Lord Heseltine & his bunch). I have chapter & verse on this – a very nice e-mail trail & an entertaining story on “non-competition” in the UK. So with gouging supermarkets so with gouging energy companies. I have no doubt that the CMA report was “massaged” by the “usual suspects” energy companies – it’s what they do. However, numbers speak for themselves and UK sheeple are getting a very very bad deal – whilst corrupt CMA lawyers count their money in new well paid jobs…. with the usual suspects or their lawyers. The UK, corrupt to the very core. The Group conducting the Competition and Market Authority’s British energy market investigation gave the energy suppliers an (almost) clean bill of health. The ‘almost’ is that the Group couldn’t avoid noticing that the suppliers were gouging consumers who never switch tariffs or suppliers, but came very close to describing these consumers as being stupid. However, the savings that the Group estimated consumers could make by switching to lower tariffs or other suppliers are almost totally illusionary. The energy suppliers can’t compete by providing clearly differentiable service offers. The same gas comes out of the pipes and the same electricity is available at the sockets irrespective of how supplies it. So the suppliers compete to gouge as much revenue as they can from final consumers. If all consumers were to switch to the cheapest tariffs available to them they might make short-term savings, but the energy suppliers would very quickly modify the tariff structure to protect their revenue yield and profitability. Energy suppliers exist to gouge consumers. The CMA Group knows this, but can’t really admit it. So instead they’re proposing a ‘safeguard regulated tariff’ to try to protect the consumers who’re being gouged. It’s total nonsense, but they have to come up with something to protect the fiction that retail competition in electricity and gas makes sense with the current technologies. And I think you’re being a tad harsh on the participants in these charades; as Mark Antony decribed Brutus and his co-conspirators “they are all honourable men (and women)”. If I were a shareholder of these energy suppliers I would not be best pleased if they were not gouging consumers to maximise revenue yield and profitability. The problem is very simple. In marked contrast to the US and Canada there is no effective representation of the collective interests of final consumers to restrain this gouging. The voluntary bodies (e.g., Which?) are just noisy, ineffective arm-wavers. The various energy related consumers councils have gone through various manifestations (Consumer Focus, Consumer Futures) only to be folded in to the previously voluntary Citizens Advice Service and have been totally emasculated. That’s how the Government, Decc, Ofgem, the CMA, the market participants and the army of advisers, lawyers, etc they retain like it. 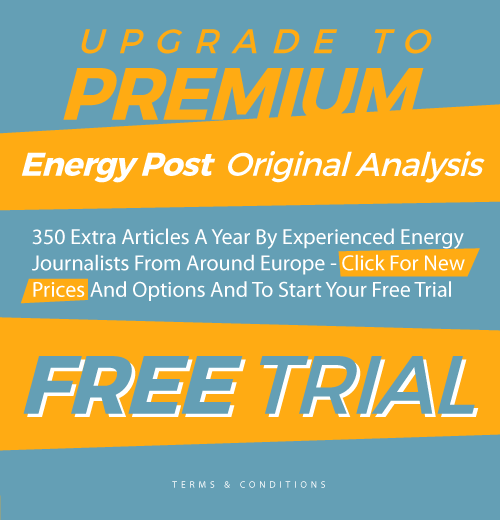 These agencies, bodies, companies and individuals and their counterparts throughout the EU provide the bulk of the readership and contributors on sites like this. It’s in their interests not to engage in any open discussion and to keep quietly capturing the rewards and economic rents. There’s a saying in Ireland that it’s the quiet pigs that eat the meal. Hi Paul – nice response – & I agree with your comments. Had a nice chat with Ofgem yesterday. There could be some “fun” quite soon on UK elec markets. I know the “big six” like surprises so I won’t spoil it for them. But there is some wiggle room for “real” competition – as opposed to what happens at the moment. Hopefully they won’t notice until it is all too late – at which point they will look like the guy in the painting “the Scream” (by Munch I think).